January Journal: Day 13 — Ginger writes. I came across a helpful new strategy for my writing recently. It's called writing for a jury of twelve. 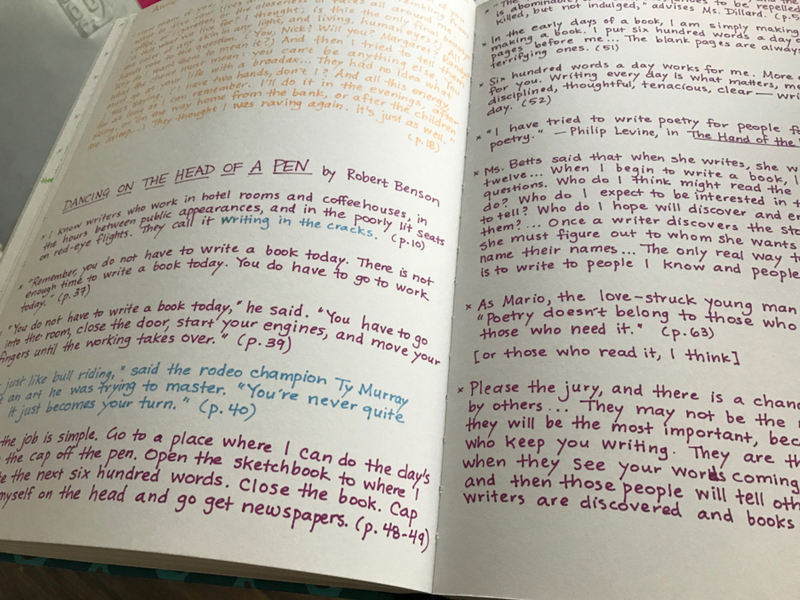 Robert Benson taught me about it in his book Dancing on the Head of a Pen, which is the book I've moved on to copying quotes from now that I've finished Writing Down the Bones. The jury idea is one that Robert learned at a reading by the novelist Doris Betts. So this is borrowed-borrowed information, but I believe both Benson and Betts would happily support my lending it to you now. "Ms. Betts said that when she writes, she writes for a jury of twelve...When I begin to write a book, I ask myself some questions. Who do I think might read the writing I am about to do? Who do I expect to be interested in the stories I am trying to tell? Who do I hope will discover and enjoy and be moved by them? Once a writer discovers the story she wants to tell, she must figure out to whom she wants to tell it. It helps me to name their names...The only real way to write, at least for me, is to write to people I know and people I love." I've been thinking lately about my jury of twelve when I sit down to write a blog post. I haven't chosen a solid dozen yet, but I've started my list on a yellow sticky note. Benson says later that the jury "are the ones who always grin when they see your words coming." I know there are not a lot of people who grin to read what Ginger writes, but I believe there are a few, and those are the people I stay in my seat for. I plant myself here, on days when there is no time for it, in moments of minimal energy and zero ideas, on that 13th day when the newness has worn off and the second wind hasn't arrived. I know from personal experience that it's much easier for me to sit and write a letter to one person than to sit and write a blog post for the so-called masses. The hard part is not knowing just who I am writing for and the general feeling that I need to write something that speaks to everyone. It works okay on some days to just decide to write for myself, to do the work and get to call myself a writer. But it's also nice to write for someone else and in turn, to know who that "someone else" is. A jury of twelve helps the situation immensely. I still may be tired or rushed, and I may not have a grand idea coming to me on this particular day, but I do have a list of people in front of me to remind me who will read what I write. I pick my dozen people, the people I believe are the grinners, and I write to them. Yesterday. Today. Tomorrow. The next day. And in doing this work, I find that my jury is picking me, pleading my case as a writer, nodding their heads in agreement, making me believe in myself, making me believe in this work.